Canggu, one of the most popular areas for surfers here in Bali, offers perfect waves for all levels of surfers throughout the whole year. 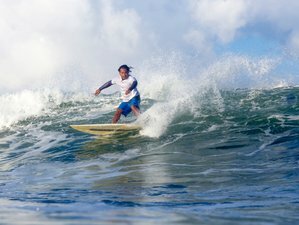 Beginners, experts, longboarders, or short boarders - everybody will find their perfect waves in beautiful Canggu and improve their skills in their professional surfing lessons with video analysis and theory. In Da Surf offers two places to stay, the luxury Pool Villa with double and twin rooms next to one of the beautiful rice paddies of Canggu and the cozy Surfers House hostel. The Pool Villa offers 14 double bed and two twin rooms and is, therefore, the perfect accommodation for couples and families. Each room has an air conditioning and a bathroom with hot water showers. The Pool Villa is surrounded by one of the typical beautiful rice fields of Bali and located just two minutes driving distance from Batu Bolong and Echo Beach - the main surf spots in Canggu. Surfers House is a cozy and familiar hostel with two four-bed dormitories and one twin room with bathroom access, which is located just two minutes driving distance from Batu Bolong and Echo beach - the main surf spots in Canggu. Every day surf spots are chosen depending on your experience, knowledge, weather condition, and other factors influencing the learning process. It helps in making the process more efficient and gives you a possibility to meet different types of surf spots. The lessons start from introduction where the guide explains important things about surfing, safety in the water, surf etiquette, and gives all information that is essential for beginners. Then you will have some stretching on the beach because your muscles should be warmed and prepared for intensive training in the water. During the lesson, there will be video shooting. After the lesson your guide will show you the video and explain all your mistakes and give you some useful tips. 100% of the guests said it gives them a really good result as they do not always understand what they are doing wrong until they do video analysis. Indra will be your instructor during the surf camp. You will surf and stay at Canggu, one of the most popular areas for surfers in Bali. At the Surfers House Hostel, you will find Indonesian (fried noodle or fried rice with chicken and vegetables) and American breakfast (eggs, ham, vegetables, toast, jam, and butter) available. All breakfast is going together with the fruit bowl or fresh juice. At the Villa, you will find a light buffet offering fresh fruits, bread, jam and butter, coffee, tea, and milk. In walking distance, you will find a lot of local and Western-style restaurants and bars which offer a huge variety of different food and hang-outs to meet locals and other travelers. In Da Surf Bali is not just a surf school and a place to stay, it is a place of kindness for your family and a home away from home.